One of my resolutions for 2014 is to be more present in the moment, I wanna be in a situation and be completely there with no distractions, I wanna be able to look back at the moments and remember how I felt and be able to properly reflect on it. 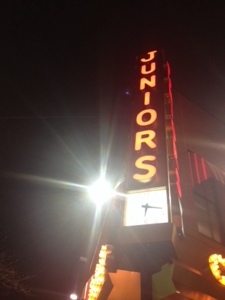 So with that being written I was very much present at “Juniors” restaurant in downtown Brooklyn, which is typically known for their cheesecake and one of the most touristy places in the hip place of Brooklyn. During my presence there was a coo in the booth behind me, the cops came into the restaurant over a “failure to pay,” with everyone over in the area attempting to ear hustle, the wait staff all standing around staring, the patrons (that being me) in the near vicinity feeling completely uncomfortable, and I often wondering if I was actually in a restaurant or standing outside of a food truck waiting for my food, I became slightly vexed. Does the Manager of an establishment have a duty to ensure that the existing patrons in the area are removed from that area to ensure that their restaurant experience is not completely ruined, is it not the Manager’s duty to communicate something to the patrons that reassures that all is well…I think a resounding…YES, but it was evident the Manager didn’t quite see it my way. Sure I could have left, but what kind of blogger would I be if I missed the blogging opportunity, so I stayed. 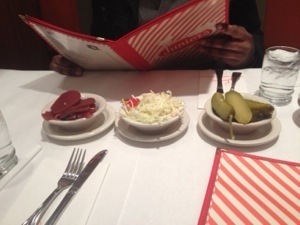 What I learned was that each table is brought a small bowl of complimentary pickles, beets, and cabbage with vinegar. Now it could have been that I was starving or that I just have a weakness for pickles, but it was actually quite delightful and tasty. Whenever you are starving you order more than you should simply, because your eyes are bigger than your stomach as my grandmother used to say. 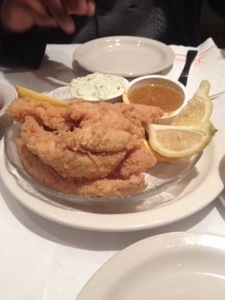 So I started with some catfish fingers with a side of tartar sauce and sweet chutney. The fingers were fried but they were just fried, no salt, no pepper, no old bay, no Mrs. Dash, absolutely nothing which equals absolutely bland and me still hungry. Why I just didn’t stop there and go,unfortunately I still cant answer that question, I mean I had already observed the police force the persons in the booth behind me to give his cell phone to the Manager for non-payment of his meal and unseasoned catfish fingers, but being a cheerleader for the underdog I somehow think that “Junior” can gain redemption with the main course, so I order the stuffed shrimp with crabmeat, with a side of corn on the cob and mashed potatoes. I always find myself slightly anxious with the anticipation of a chef’s spin on an old classic. Well what I discovered after the first bite was no new spin, nothing creative, but imitation crab mixed in with very little claw meat which really translates into not tasty. 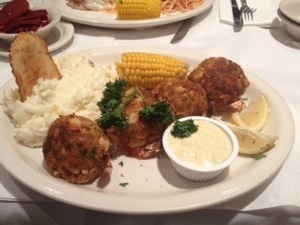 When I inquired on if the crabmeat was imitation just to give my palate reassurance that it was tasting imitation and not the real deal, the waiter insisted that it was not, but as Oprah says “…one thing I know for sure…” that crabmeat was imitation and I was duped, but the mashed potatoes were fair. Junior my theory has always been that what you lack in flavor sometime the customer service can cover a multitude of sins, but on both counts Junior you failed, never should a patron view the indiscretions of other patrons, if you opt to sell imitation never lie about it, and lastly put your patrons happiness above all else. Now I see what get when I am completely present, complete and utter foolishness. 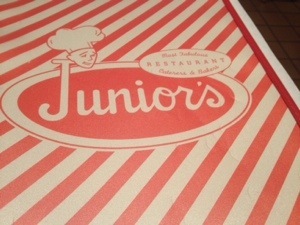 If you are visiting Downtown Brooklyn, dont get suckered, dont go to Junior’s. Wow I am sorry to hear the restaurant is up to the standards that have been bragged about by several people.